In Louisiana, there is no better time than Mardi Gras. 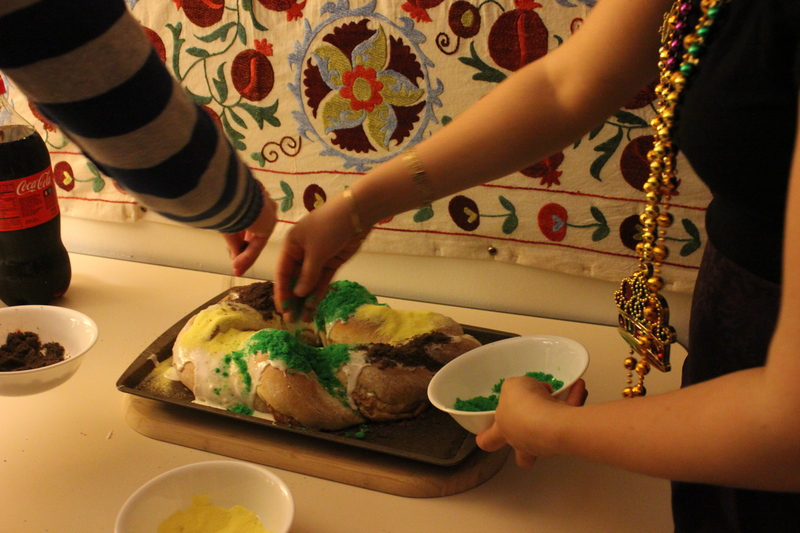 Along with all kinds of festivities, a highlight of the season is the food… and by food I mean the delectable King Cake. One reason why I believe King Cake is so special is because it is only available from Epiphany (January 6th) through Fat Tuesday (the day before Lent, which can be anytime in February or March). 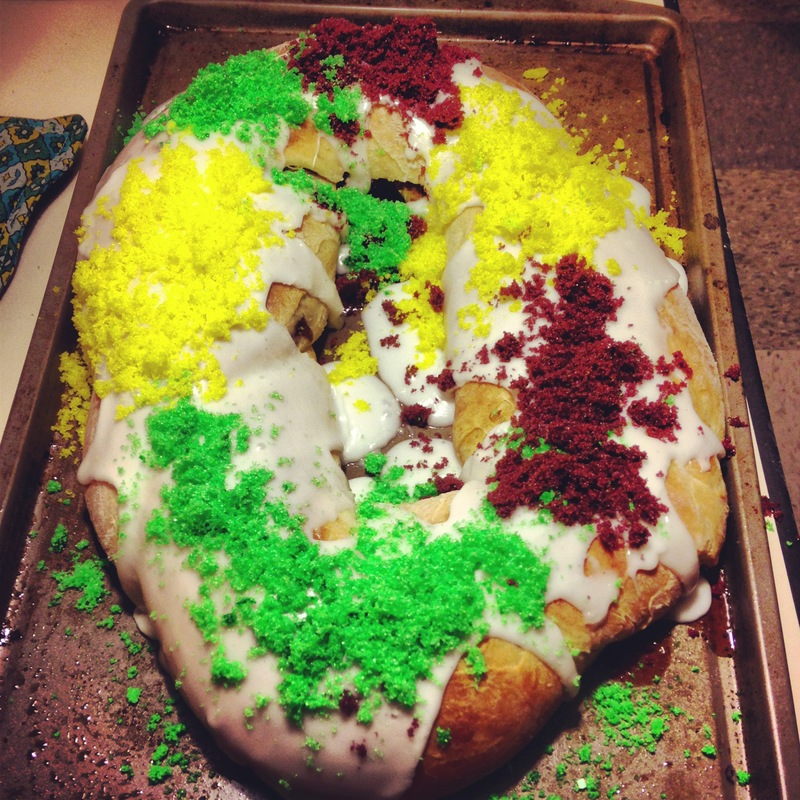 A version of King Cake is eaten in several parts of the world, including France, Switzerland and Belgium. While other cultures usually eat it only close to Epiphany, in the American South we happily consume it as long as possible through the whole Mardi Gras season. The American version of this cake is similar to a cinnamon roll both in texture and in taste – the dough itself is not very sweet. Don’t let this fool you, however, because there is plenty of other sugar involved. Cakes come filled with cinnamon and sugar, fruit preserves, cream cheese, or sometimes other interesting flavors like pecan praline. The top of the cake is iced with a sugary glaze completed with granulated sugar that is yellow, green, and purple -the traditional colors of Mardi Gras. What makes this cake extra special is a little game that goes along with it. Hidden in the cake is a plastic baby, about the size of a quarter. Whoever gets the baby in their piece is declared the king/queen and is responsible for buying (or making!) the next cake. Since I’ve moved out of Louisiana, I find missing Mardi Gras to be unbearable. I usually compensate by making a king cake and throwing beads at my friends. Northerners tend to get pretty nervous about the idea that there is a little plastic baby in a cake, but I will say that they get over it – I’ve never made this cake without having the entire thing quickly devoured. In the past three years I’ve made this cake with one of my favorite people in the world (and my far my favorite cook from Louisiana). This is an adaptation of his recipe. Add both liquid and eggs to the dry mixture. Add as much additional flour as needed (2 cups minimum) and mix with a wooden spoon until mixture no longer sticks to the sides of the bowl. Turn onto a floured surface. Knead and add flour until you have a moderately stiff dough (about 7-10 minutes) you will be able to feel when the dough is stiff, trust us. Melt some butter in the bottom of a large bowl (microwave it if you can because it will warm the bowl as well). Place dough in the bowl and roll in the butter. This will stop it from drying out while rising. Cover and let rise in a warm, preferably humid, place for about an hour. You’ll know it’s ready if when you poke it the dough doesn’t bounce back instantly. 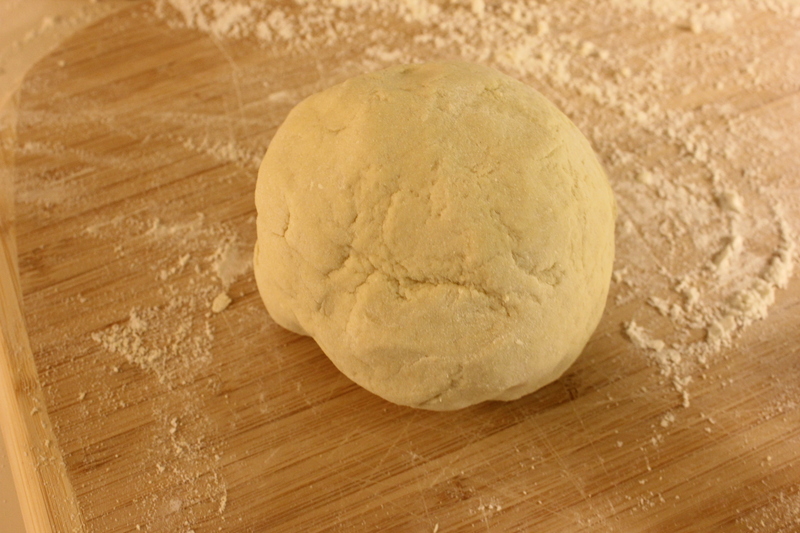 Punch the dough down and divide into two equal pieces. Roll each out into a rectangle. The rectangle should be as long as possible, but not very wide (6 inches wide is about the maximum it can handle). The thinner that you roll it out the more layers you will have. Melt about ½ a stick of butter. Mix ½ cup sugar and 1-2 tbsp cinnamon together. Using a pastry brush (or a spoon if you don’t have one), spread the melted butter over the entire rectangle, leaving about an inch of dry dough along one long side. If you are adding a filling, spread the filing along the long end that has butter (not the dry end). In the case of cream cheese, roll the cheese into a rope with your hands and place along the buttered long side. If you want filling to be in every layer of dough spread across entire rectangle. We almost never use filling but if you’re ambitious knock yourself out. 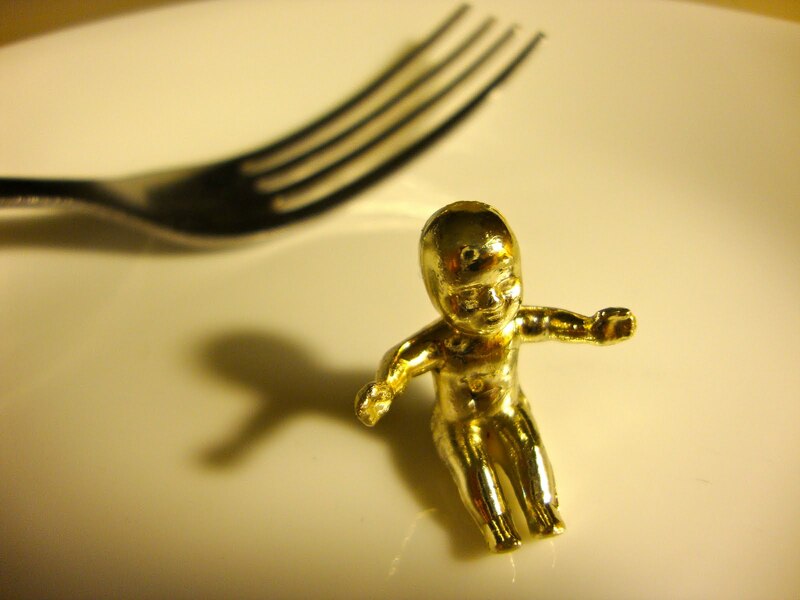 Place the baby somewhere on the buttered long side. Remember where on the cake you placed it, so that you make sure not to eat from that part of the cake so that you don’t have to make/buy the next cake! Starting on the buttered and babied long side, roll the dough up. Place the roll on a buttered baking sheet so that the seam of the roll is on the bottom. Roll into a donut shape, placing one end inside the other end. Take one end, squeeze it and put it into the other end so that you seal the cake into a complete circle. Wet your fingers and use them to wet the dough underneath the seam. When the dough is wet, it will stick to itself, so you can use this to seal up all the seams. When you’re almost ready to eat, make the frosting. Put several cups of powdered sugar in a bowl. Add a tiny bit of milk and mix. Keep adding milk and mixing until you have a thick glaze. Pour over cake. Now make the colored sugar. Fill 3 bowls with granulated sugar. Add a few drops of food coloring (normally about 5 drops), making one bowl yellow, one green and one purple. Mix with your fingers until sugar is evenly dyed. Sprinkle over the cake. Enjoy and make sure to warn your guests about the baby, you don’t want anyone to choke!